Christian Faith Healing The Path Of Receiving Supernatural Healing As Jesus Healed! 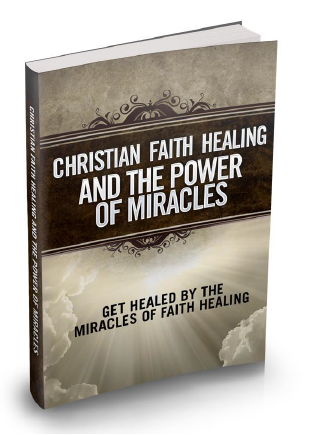 Chapter 2: What Exactly is Christian Faith Healing? Chapter 3: How Does Jesus Heal? In ancient times faith healing was widely accepted as the only form of healing for both physical and mental health problems. As the development of science had not yet come about or even existed, this process was considered authentic, especially when positive results were achieved. In the scientific world this healing is achieved though medications recommended by medical physician. These medications have gone through the various strict research regiments before becoming the possible solutions to both physical and mental health problems. Faith healing on the other hand is predominantly practiced by persons who professes religious authority and claims to be spiritually connected to the other perceived spirit realms. Faith healing can is practiced by all different types of people and is not limited to the believers of a particular religion. Almost all religions today practice some degree of faith healing. Popularly regarded as a channel of energy released in an individual with strong faith in his or her professed religious beliefs, this style of healing is sometimes also used when all medical possibilities have been exhausted. The energy said to be produced in faith healing sessions is very powerful indeed. For the Christian theological sects, God’s Spirit working in faith healing processes is the contributing factor to its claimed success. The focus of the individual is on God’s Spirit working to achieve complete optimum health and not man’s ability.